A traditional Hop-tu-naa celebration held at Cregneash in the Isle of Man could be affected by a lack of turnips, according to Manx National Heritage. The crop has been ravaged by the wettest summer in Manx history. Manx National Heritage's Howard Parkin said: "Turnip carving is an important part of the festival but we can't do anything about the weather." The Manx celebration is traditionally held on 31 October and marks the end of the summer and the beginning of winter. It is held on the same day as Halloween, which is celebrated with pumpkin carving across the UK and further afield. Cregneash Village Farm Manager Peter Kelly said: "It's been a terrible year for the crop." He said: "Usually there are around 2,000 turnips in the field. At the moment there are a dozen at most. "They are small, probably around a third of the size we would expect at this time. It is very disappointing." The crop is also used as sheep feed through winter and Mr Kelly said: "I've lost three quarters of my sheep feed this year so it is a big issue." 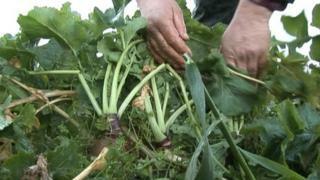 Mr Parkin added: "It is an important part of the festival but there are other vegetables that could be used. So parents can bring whatever they can and we will do our best." Normally around 3,000 children attend the festival.